For the Folengo text "Triperuno" there's the idea, that it not only contains just 5 Tarocchi sonnets, but that the row of the Tarocchi build up a meta scheme based on a Tarot card sequence. Which ? That's naturally a riddle, and that's extraordinary complicated, cause Folengo alias Merlinus Coccai didn't feel in the mood to make it easy for his readers. So we have in that, what probably is chapter 13 naturally DEATH, and the death tragically occurs to Galante, celebrated two chapters before as part of the big love story "Amore di Triperuno e Galanta". Well, Triperuno is the three-fold author, which means Folengo himself in all his pseudonyms, and Galanta is a weasel, which finds its cruel end, when a door is closed with too much energy. So - in a big step, which follows DEATH - we have now in chapter 14 - TEMPERANCE - the almost logical FUNERAL: A series of poets give some consolation poems to celebrate the event and with this the second part (= second forest) of three finishes (the text is structured 0, 1-3 (first forest), 4-14 (second forest). 15-21 (third forest). ... and a girl is modified to a weasel, finds her end, and ..."When Heracles grew up, he built a sanctuary to Galinthias and sacrificed to her; the practice of honoring Galinthias in Thebes lasted down to late times." Here "FAME = TEMPERANCE" is interpreted as "FUNERAL ORATIONS" ... a rather logical idea. Well, we know, that Father Time appears inside the Tarot Sequence between 6 LOVE and 13 DEATH and not between 14 TEMPERANCE and 20/21 ETERNITY. This would give a sort of perfect harmony between Petrarca's 6 Trionfi ideas and those observable in the Marseille Tarot. As if the Tarot had been developed from Petrarca's ideas in a direct way. a. there were also other orders, and none of the others has a "high Temperance"
Time actually is governed objectively by Sun, Moon, Stars (by these it is measured), and subjectively by the personal hourglass, as carried by Father Time. So the man with the hour glass is correctly placed "before DEATH (= 13)", as he relates to personal time. But Temperance (= FAME) connected to the "mechanical clock" is correctly above DEATH together with Sun-Moon-Star. What's with this fame obsession? First the world is fame, now temperance. The only card that ever got turned into fame was the judgment card in the Minchiate. Fame is treated as immortality in many classical sources, also the resurrection can be considered as God remembering us. So it makes sense to regard Fame as the secular equivalent of the last judgment. But I don't see much sense in connecting Fame to the virtue. Cicero introduces temperance after discussing justice and strength, defining it in terms of the character in literary figures. He beings by saying that a temperate Atreus would be very different from a temperate Oddyseus. He then goes on to suggest temperance is about propriety, staying in character, and not getting carried away; that is, more the antidote to enthusiasm and flightiness than to addiction. But how does this fit to the other cards? The early Tarot de Marseille appearance of justice makes sense if Cicero is the source; since for him it is the virtue that governs social relations, which to the Romans includes war (i.e. governing Miserio to Chariot). Strength fits maturation and aging (governing Hermit to Death), since for him, it is not so much bravery as mental toughness and perseverance in the face of adversity. But the late appearance of Temperance in the Tarot de Marseille sequence is still very odd, even in this definition. How can propriety and staying in character allow one to successfully harrow hell and rise to immortality (devil to world)? Cicero does not explicitly equate temperance with the characteristics of Stoic sagehood, apathea and ataraxia, which do confer death defying powers. But I'm wondering if in the 16th century, his remarks on temperance might have been read in this way. Jim Schulman wrote: What's with this fame obsession? ... :-) ... a wonderful chaos, all not really finished. In essence it starts with the observation, that Alciato used Fame instead Temperance for the Tarot sequence position 14 (1544, I think), and that later in the Vieville (c. 1650) and the Belgian Tarocchi (18th century) the card Temperance got the inscription Fama Sol or Sol Fama. And somehow Temperance got then wings (not in the Belgian Tarot, but in the Marseille), which before could be observed for the figure Fame. Jim Schulman wrote: First the world is fame, now temperance. The only card that ever got turned into fame was the judgment card in the Minchiate. Fame is treated as immortality in many classical sources, also the resurrection can be considered as God remembering us. So it makes sense to regard Fame as the secular equivalent of the last judgment. But I don't see much sense in connecting Fame to the virtue. As already explained, Fame was occasionally connected to Prudentia, Justice and also Temperance. This happened in the discussion recently, in the Hermit and Temperance thread. Cicero has to the origin of Tarot likely a little more distance than the Trionfi of Petrarca, which at c. 1440 were quite just around the corner, together with Fame, which belonged to the often used iconographic topics then. Well, I searched for "Temperances with wings" like in the Noblet Tarot. This seems to be oldest, as far Tarocchi cards are considered. I noted, that this should be a rare motif. The Vieville Tarot Temperance hasn't wings. But the Marseille and also the Besancon Tarot Temperance has wings. Then I looked for virtues with wings. I found SPES with wings. 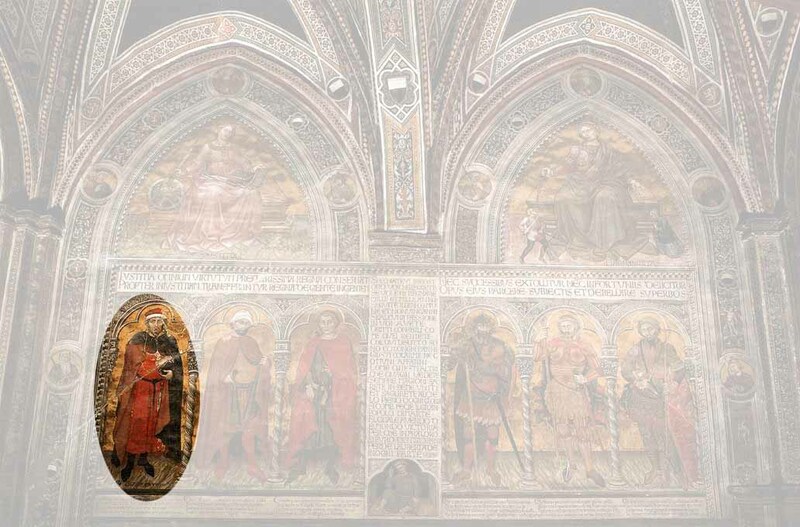 Spes: From Florence or from Florentine artists and all very early. more or less identical to the common Minchiate motif for Spes, but then without "wings"
I found also a winged Hope of Hans Sebald Beham (first half 16th century), but this can't be counted, as he had all virtues "winged". In this picture the "wings" of Spes have been transmuted to a bird, and the anchor became the deciding sign (Jacob Matham - 1571-1631 - after Hendrick Goltzius). Anyway, SPES = Hope lost its wings (at least it seems to me so after perhaps only too short a research), and got an anchor. And Temperance got wings ... at least in Tarot. SPES = HOPE recently became of interest, when I followed the line of modern divination. 1. There was Minchiate in Florence in 16th century, and it had 35 numbered trumps. 3. Franco Pratesi found a list of 35 cartomancy terms in Bologna related to cards, dated around 1750. 4. There was a German author in 1763, who described a coffee reading system with 35 units. 5. There was a race game "Spiel der Hoffnung", made 1799, played with two dice and 36 cards, from which the 36th card wasn't used, but presented a waiting field. The 35th field or card was the goal and winning field of the game, was called "Hoffnung" and it showed an anchor. 6. In 1846 the cards of the "game of Hoffnung" were made to a new divination deck and it was called "Le Petit Normand" ... with 36 cards. So I think, that there was a sort of divination game based on the Minchiate, somehow originating in Florence, which in different steps developed through the times in different forms of divination. Possibly the term "Hoffnng" was connected to such a divination system and possibly this influenced the iconography of hope. In the general society development we have, that sea travels and navigation gained importance between 14th and 18th century, forming the world of colonialism. The "anchor" dominated, the art to fly with Jumbo jets still didn't exist. Nonetheless "wings" got a great career in art history with all these putti flying around. So naturally "wings" lost their signifying meaning, Hope lost them and took the anchor. But then we have - though much later - that the wings returned to the world of virtues, now adapted to Temperance. Hope as a "theological virtue" - connected to Caritas and Fides - got some competition by Hope, the "Stoic passion", in this other world connected to Love, Fear and Jealousy, things, which involve naturally the flying Amor accompanying Venus, so somehow the "putti" as a genre. Likely Hope, the theological virtue, didn't love this connection too much. Too much opportunity for a little mockery about the sexual life of priests. Well, another reason to decide for Hope without wings, but with anchor. Nonetheless, Temperance took the wings. The Minchiate Francesi around 1660 decided to have 5 virtues, Fides and Temperance were dropped. But it contained Renommée with wings (Fame). But the original Minchiate had 7 virtues plus Fame. The Etteilla had two different Temperances, one with wings and the other with elephant. ... and the usual Angel or Judgment card was mutated to "birth of mankind"
I don't get it Huck, why would Cicero be less likely an influence on the tarot in the XVth century than Petrarca ? Cicero being one of Petrarca interest I don't get your point. ... .-) ... I think, it's easy to realize, that's a difference of influence, if Petrarca read Cicero (and likely he read works of some more persons than only from Cicero), or if he presented a poem, on which he worked 20 years. And it's a difference of influence, if 15th century produced a great number of Trionfi editions (from which some motifs really are found in Tarocchi versions), or if the 15th century knew also about Cicero (between many other antique writers). And here another: "young Cicero reading ..."
I didn't say, that Cicero had NO influence on Tarot (everybody and everything influences everybody and everything, that's a sort of law), but I stated, that Petrarca's Trionfi are nearer to the Trionfi cards than Cicero ... and the Trionfi cards are the object of our research. Cicero is said to have reduced the virtues to 4. Nice ... this had influences on the Tarot, but this has as cards not only 4 virtues. Cicero was dead about 1400 years in Petraca's time. Charlemain is only dead about 1200 years, but surely he somehow influenced me and my culture. But there were meanwhile many others, too, right? It's not necessary to refer to Charlemain, if I discuss Computer or other inventions of the 20th centuries, I would say, even if Charlemain had the idea, that people should be able to read and to write. Huck wrote: Cicero was dead about 1400 years in Petraca's time. Charlemain is only dead about 1200 years, but surely he somehow influenced me and my culture. But there were meanwhile many others, too, right? That means you consider the literary influence of Charlemagne nowadays equals Cicero's literary importance in the XIVth and XVth century, doesn't it ? edited to add : also why did you think it was necessary to repost today your message from yesterday after Jim's reply ? Bertrand is right, Huck. Once is enough. Do you want to remove the duplicate post, or shall I? Thanks - except you deleted the original, rather than the duplicate. I don't know how to "un-report" Bertrand's report of the duplicate post, though, which means that for the moment, at least, it will stay highlighted with a soft rose background. However, if I consider the European Union of 20th century, it might well be that it was his idea ... so, he was "somehow" influential. Cicero had 31 printings during 15th century. That's not bad. But do we talk about literary influences or about objects in iconography? Cicero was famous for his literary style. How would you express this in pictures? Are Cicero editions famous for their many pictures? Petrarca's Trionfi are famous in this context. Well, had Cicero's Temperantia wings? This would be an interesting question. Or a clock as attribute? Or an elephant? 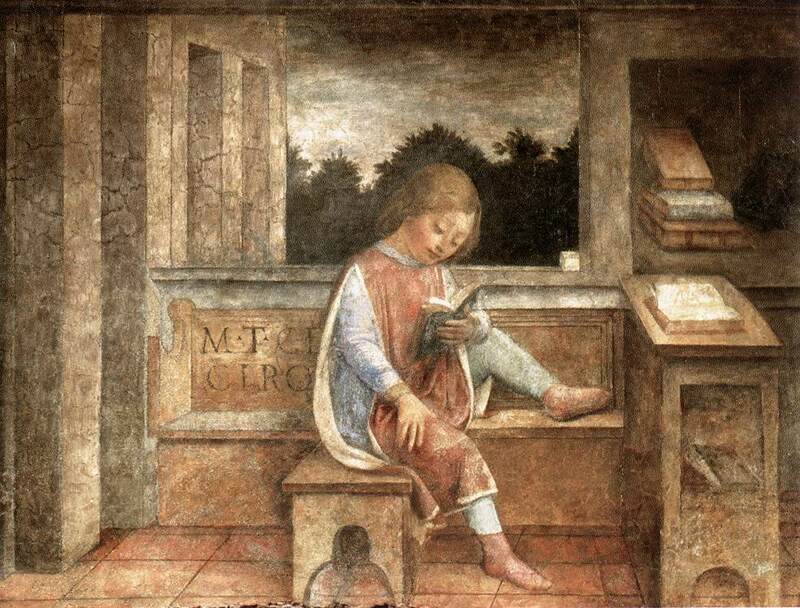 Or another question: Do we have some indication, that in the critical time of c. 1440 (the moment, which interests us) the text of Cicero had a very specific literary renaissance, which mobilized some painters to express Cicero content in their productions? My comment: "Cicero had 31 printings during 15th century. That's not bad." This seems to be not correct. It just depends on the counting method. Another form of data research lists more than 300. This is indeed very much. But does it lead to iconographic influence?